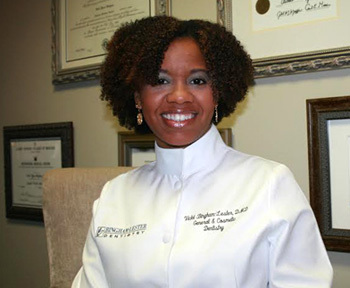 Dr. Vickii Bingham-Lester began her journey into dentistry at Spelman College in Atlanta, GA. She is a graduate of Tufts University School of Dental Medicine, and completed residency in general practice at Montefiore Medical Center in New York City. Dr. Bingham-Lester worked in the public health sector and in private practice in New York for several years before relocating to Maryland. A special interest in helping patients enjoy a high quality of life with healthy, functional smiles led Dr. Bingham-Lester to delve deeper into the science and practice of dental implantology. She earned Fellowship status in the International Congress of Oral Implantologists, a well-respected dental implant educational organization. Dr. Bingham-Lester performs both placement of dental implants and final restorations. Dr. Bingham-Lester loves the energetic vibe of the Baltimore/DC area, and the friendliness of suburban Gambrills and Crofton, MD. Her dental office has state-of-the art equipment and technologies, in a warm, inviting atmosphere. Bingham-Lester Dentistry is a family practice, welcoming patients of all ages for a broad range of dental services – preventive, restorative, cosmetic, and surgical. Dr. Bingham-Lester and her husband, Mark J. Lester, M.D., a pediatric physician, live in Crofton with their sons Xavier and Mark Joseph.